Hi, my darlings! I have a very special collection to review for you today! 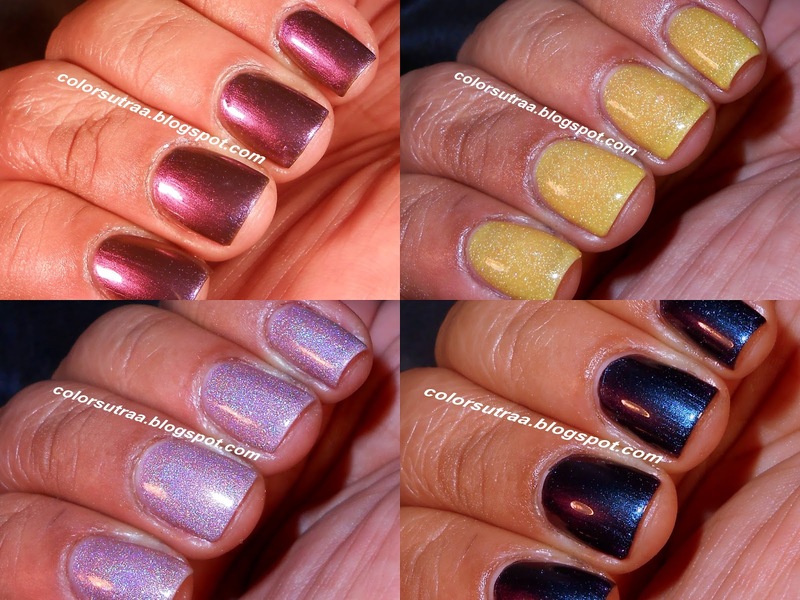 Now, as many of you know, I've had the pleasure and privilege to be working with Color4nails for a few months now and today, I would like to show a collection exclusive to the Color4nails site and hence very special to Sisi, the owner--the collaboration Game of Thrones collection with Celestial Cosmetics! This collection is comprised of gorgeous thermal holographics and unique multichromes that have been inspired by some of the character's in R.R. Martin's "Game of Thrones" series. As complex and spellbinding as that series of novels and shows are, you know this had to be a collection worth the name! Today, I shall show you two of the multichromes and two of the thermal holographics. First up, I have for you Jaqan H'ghar--a gorgeous multi-chrome that flashes from a red-toned mauve to a purple to a rich blue! The formula for this was a bit on the thicker side and I recommend using generous coats to avoid any chance of streaking. For the swatches below, I used 2 generous coats, topped with 1 thin coat of G&G's HK Girl. I love the transformation of this polish when I used the flash on my camera--I was literally left open-mouthed! Next up, I have for you A Lannister Always Pays His Debts--a lovely golden yellow thermal polish with scattered holographic sparkle. The formula on this was a little on the sheer side and I used 4 coats for the swatches below--the application, however, was fabulous! As a word of caution, though this is indeed a thermal polish as you can see from my last set of photos, I found it quite a challenge to bring about the color change. The polish is this lovely shade of yellow when warm/at body temperature, but is supposed to turn a gorgeous orange under cold temperatires--I dipped my hand in ice-cold water for several minutes but the effect didn't last for more than a few seconds. =( That being said, the color while warm is gorgeous enough! To show the color change when cold. Next up, I have the magnificent Kingslayer--a truly stunning multichrome that flashes from a deep indigo blue to a rich purple to hints of teal! The formula and application of this were both really great and I used 2 coats for the swatches below, topped with 1 thin coat of G&G's HK Girl. Isn't this AMAZING?! Last but definitely not the least, I have for you my personal favorite of the four, Ironborn--a beautiful pinkish-taupe thermal polish with a loose linear holographic effect. No complaints on formula or application and I used 3 coats for the swatches below, topped with 1 thin coat of G&G's HK Girl. This is another thermal polish and bringing about the thermal effect was much easier with this one--in cool conditions, this polish changes to a stormy dark gray! I absolutely love this one! So which one of these four is YOUR favorite? As always, I welcome your feedback in the comments section below!